I discovered runmap.me and I’m hopelessly hooked- I can map my trail rides and measure how far we rode. I’m sure I could do the same thing with a smartphone, but that would require me to get a smartphone (I’m stubbornly avoiding it). On Saturday, Wizard and I rode for 4.68 miles. We rode past the log cabin, out the side field, and trotted up the “bowling pin” hill. Wizard was so fresh and happy to be out that he was purring/”truffling” LOUDLY- he was so snorty it made me laugh. He sounded like the racehorses when they step out on the track for a morning jog. We rode across the fields in a serpentine pattern as a schooling exercise. When I crossed my own path, I could feel Wizard nudging me to head back to the barn. He listened, though, when I told him to go on. He was very good when we rode through the Horse Park, and spooked once for good reason when some clumsy creature crashed through the treeline. 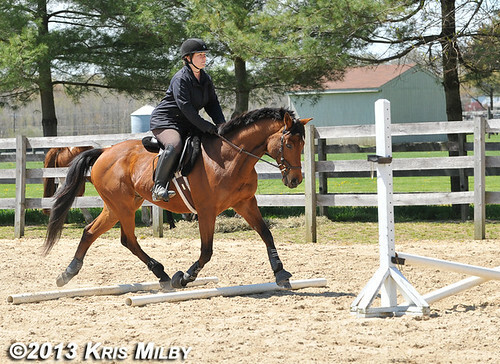 Wizard was able to hold his trot on a variety of terrains without breaking to a canter. He stumbled a few times in the beginning of the ride, but as he warmed up, he felt more surefooted. When we returned to the barn, he was sweaty under the saddle, but cool otherwise. I cleaned my tack while he enjoyed some fresh spring grass. His weight looks just about perfect now- the grass really filled him out nicely. Kris and I took a walk in the Assunpink for about 1.8 miles, followed by a short ride in the outdoor arena. I only had about 12 minutes to ride in the arena, so we did some trot, walk, canter transitions. After a few attempts, we actually got something pretty nice at the canter. I brought him right back down to a trot, and we took a tiny cross rail a few times at a walk and trot, followed by a leg yield to the rail. When he tried to rush it at the trot, we walked to it. For a quickie ride, we got some nice work accomplished. Can I ask which barn you ride at? Thanks! Stone Tavern Equestrian Center.